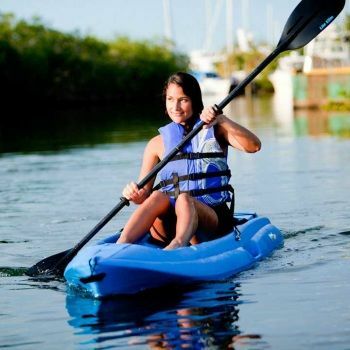 Looking to try kayaking? Check out the Lotus Kayak from Lifetime. This sit-on-top model is super stable and almost impossible to tip over, making it ideal for beginners. It’s loaded with built-in features like foot wells for leverage when paddling, an adjustable back rest, a storage hatch, complete with shock cords, a bottle holder, and even a child seat. Time to get out on the water!